Delicious dual textured cat treats with a tasty crunchy outside and an irresistible soft centre. Prepared in delicious varieties, including tasty chicken & cheese, beef, salmon, seafood and turkey, because your cat naturally seeks a varied diet. Less than 2 Kcal in every cat treat. Cat biscuits with added vitamins and minerals and no artificial flavours. 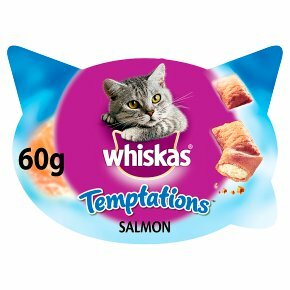 Whiskas® Temptations are delicious cat treats with a tasty crunchy outside and an irresistible soft centre. With a range of mouth-watering flavours, containing extra vitamins and minerals, and with less than 2 Kcal in every treat, they are a great way to give your cat a treat they'll love.